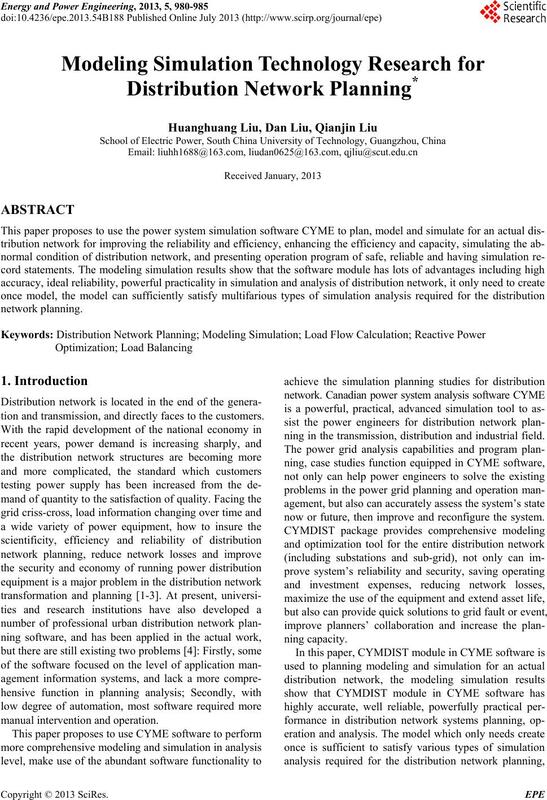 tion and transmission, and directly faces to the customers. manual interv ention and operation. ning in the transmission, distribution and industrial field. now or future, then improve and reconfigure the system. behind, so most distribution system’s net rack is weak . operating cost has prominent economic significance. software is introduced into domestic in this context. ring network and grid-shaped network. H. H. LIU ET AL. topology model of this area is shown in Figure 1.
ning perfo rmance of CYM E sof tware. 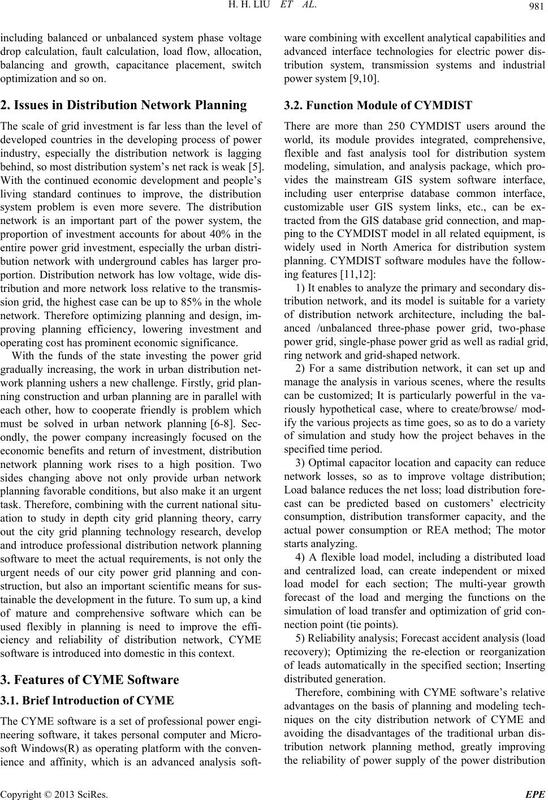 tirely regional distribution network power come tru e .
To change the default, adjust the template as follows. basic flowchart of the settings can be seen in Figure 2.
loading, Overloaded conductors and Summary Report. be converted to 0.1547 $/kWh in CYME software units. Figure 2. Flow chart of load flow analysis. Table 1. 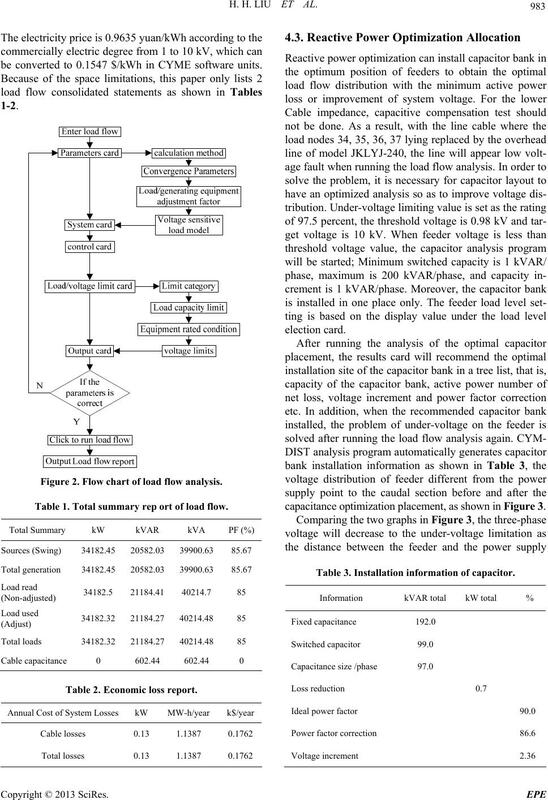 Total summary rep ort of load flow. Table 2. Economic loss report. 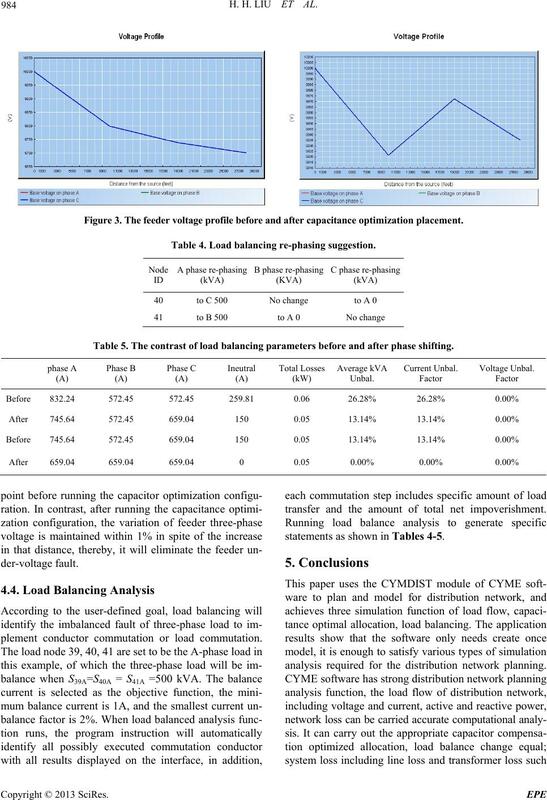 capacitance optimization placement, as shown in Figure 3. Table 3. Installation information of capacitor. Figure 3. The feeder voltage profile before and after capacitance optimization placement. Table 4. Load balancing re-phasing suggestion. Table 5. The contrast of load balancing parameters before and after phase sh ifting. plement conductor commutation or load commutation. transfer and the amount of total net impoverishment. statements as shown in Tables 4-5.
analysis required for the distribution network planning. No. 16, 2008, pp. 66-70.
ogy, Vol. 19, No. 33, 2009, pp. 92-99. 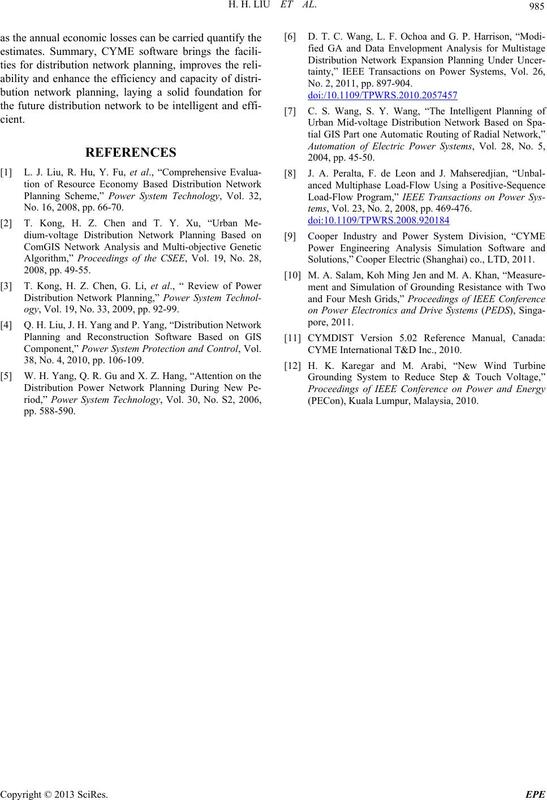 Component,” Power System Protection and Control, Vol. 38, No. 4, 2010, pp. 106-109. No. 2, 2011, pp. 897-904.
tems, Vol. 23, No. 2, 2008, pp. 469-476. 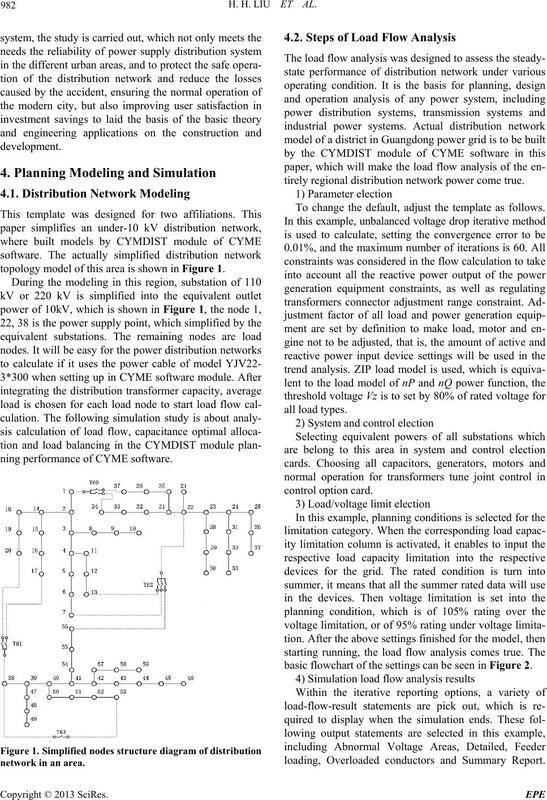 Solutions,” Cooper Electric (Shanghai) co., LTD, 2011. CYME International T&D Inc., 2010. (PECon), Kuala Lumpur, Malaysia, 2010.